Ginger (Zingiber officinale) is known to aid digestion and strengthen the immune system. It is used as a home remedy (flat ginger ale) when feeling under the weather or nauseous, and is blended with honey and lemon in a drink to ward off a cold or flu. Now ginger has come back into the spotlight, this time to promote healthy skin. One of ginger’s active enzymes – zingibain – reduces inflammation, therefore reducing the risk of acne, psoriasis, and other inflammatory skin conditions. 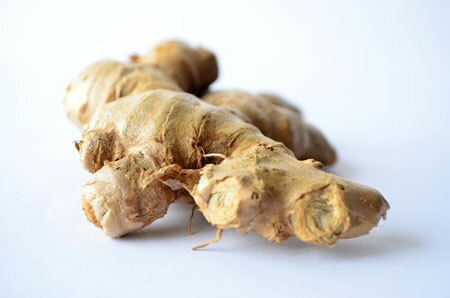 Ginger’s antimicrobial and antiseptic properties can also kill the bacteria that causes acne. It promotes skin elasticity and firmness due to its antioxidants gingerol and shogoal, which have been both shown to fight skin-damaging free radicals. To achieve these skin benefits, I advocate using actual ginger root. Why take capsules when you can use the root? It is less cost-effective and has a great return on investment. Ginger is also a wonderful warming spice with which to cook. It is often used in Indian and Chinese dishes, and in desserts. It’s also easy to use the root to make a cup of ginger tea. Peel the ginger root and cut it into thin strips. Steep the strips in a cup of boilder water for 10-15 minutes. If need be, sweeten the tea with other warming spices, such as cinnamon and clove, along with agave nectar. When you are unable to brew a cup of ginger tea, add a drop of ginger essential oil to your daily moisturizer. If you are looking at using it for other health benefits, such as reducing the pain of arthritis, you can massage the painful area with the essential oil. Please note essential oil is not for internal use. Several new studies have also shown that ginger may help reduce anxiety. Not convinced yet about the benefits of ginger? Some say it could also work as an aphrodisiac, due to its promotion of blood circulation.